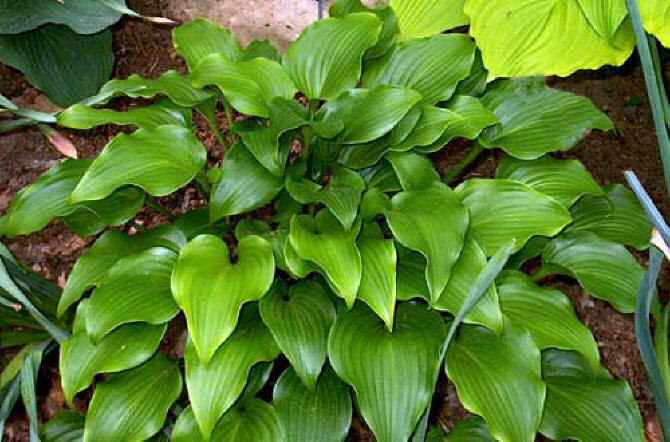 This hosta species grows into a small size plant about 6 to 10 inches high by a spread of around 10 to 18 inches. It has waxy green foliage that is shiny, leathery with thick substance. The petioles are purple-red and the leaves are somewhat twisted with a sharp point. It bears lavender flowers with purple stripes and purple-yellow anthers in September followed by viable seeds. This species is found on rocky mountain sides in its native land. 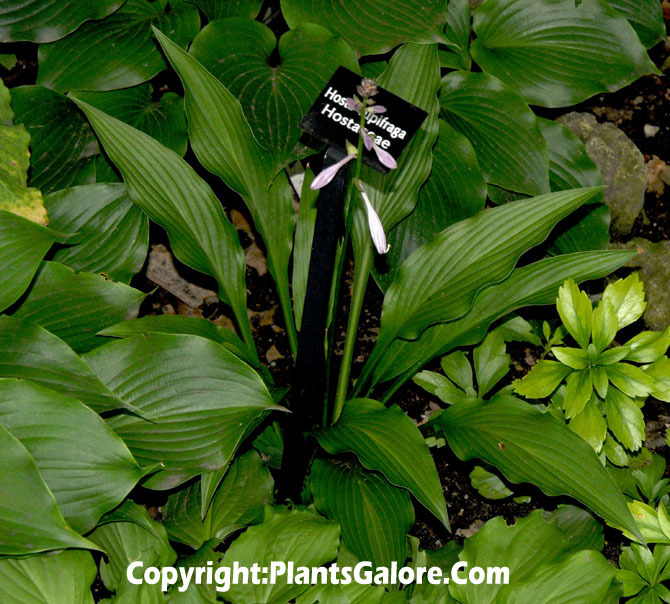 The New Encyclopedia of Hostas by Diana Grenfell (2009) states: "Glossy, leathery leaves." 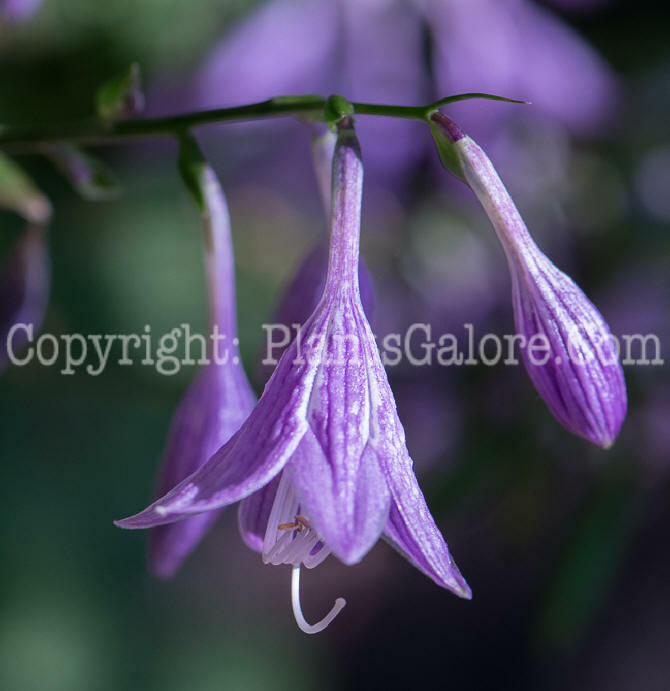 An article about Fall Bloomers by Herb Benedict and Jim Wilkins in The Hosta Journal (1991 Vol. 22 No. 1) states that, "Here are some of the fall blooming plants we grow...(listed in the order of bloom times in Michigan). 1) H. kikutii A medium size plant densely flowering with white blooms. The flowers are equally arranged around the central axis of the raceme so that the bloom scapes resembles a bottle brush or pony tail...We are growing two named varieties, 'Hirao-59' and 'Finlandia'. 2) H. 'Fall Bouquet' Small, green plant, leaves slightly undulated, lavender scape and blooms, floriferous. 3) H. longipes Small green plant, densely flowering with a tall stiff bloom scape. The flowers are lavender and the leaves are green. 4) H. gracillima Funnel-shaped, light lavender flowers. A miniature green plant, with shiny surface. 5) H. 'Iwa Soules' Iwa means rock, and this plant was imported by Marjorie Soules, from Japan . It is a small green plant with lavender flowers. 6) H. tortifrons In the same section (Picnolepis) as H. longipes and H. rupifraga . Distinctive small plant, with twisted green leaves and lavender flowers. 7) H. 'Fused Veins' Small, green leaves often with ¼ inch margin which is a lighter green. The lance shaped leaves are undulated and the veins come together regularly. The flowers are mauve and the scape is sometimes branched. 9) H. tardiflora This small hosta is the last to bloom for us. Its leaves are shiny, dark green and lance shaped. The flowers are light lavender and borne in abundance on 12 inch scapes. Note: Nomenclature changes recommended in the 1991 book The Genus Hosta by W. George Schmid and accepted by The American Hosta Society would update names as follows: H. tortifrons is now H. 'Tortifrons' and H. tardiflora is H. 'Tardiflora'. An article by Dr. Ben J.M. Zonneveld in The Hosta Journal (1996 Vol. 27 No. 2) states that, "...I found in the garden of Hideko Gowen,..I also found a seedling of H. 'Salute' (a H. rupifraga × H. kikutii prunosa cross or, is H. 'Blue Cadet' also involved?). It had a total of eight scapes in bud...The peculiar thing was that there was just a single crown with about eight leaves. Surely a plant to give some attention."